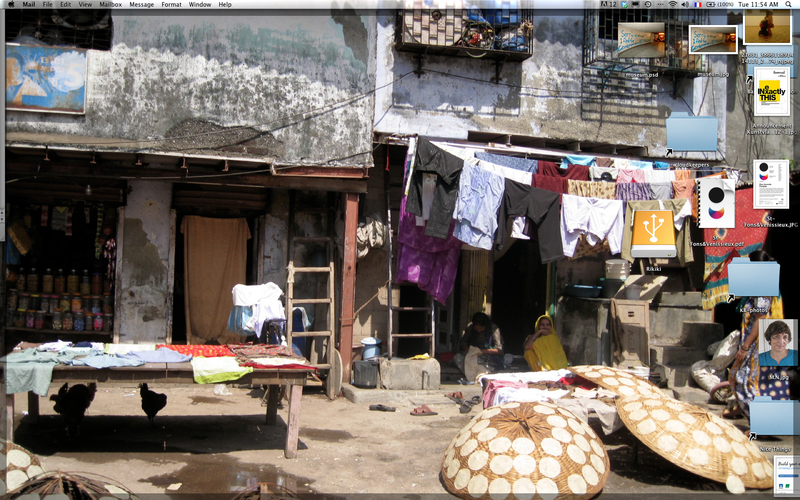 Background picture taken in the slums of Mumbai (Dharavi) 3 years ago. This is a “multitasking” space represented in this picture. Chicken are resting under the shadow of the table, clothes are drying on top of it on the table and behind it is a shop full of multicolored jars. The rest of the laundry is drying on the lines. On these round curved baskets the papadums are also drying in the sun after having been streched by hand from a tiny ball of dough by the local ladies. Just like on my desktop,the main space looks quite empty and resting in the vertical sun, but so busy at the same time… Look closer, click on the screenshot and observe it full-size.